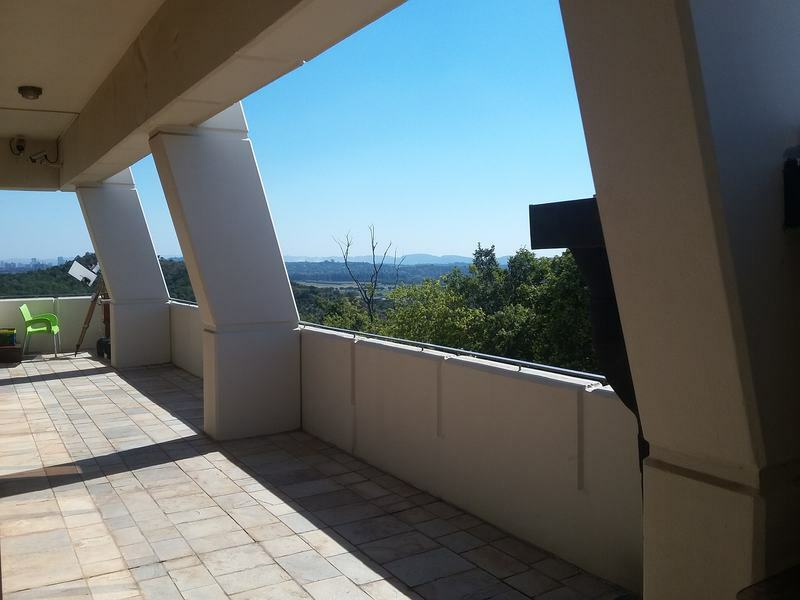 A venue with an unobstructed view of the north-western horizon from a wide balcony has kindly been provided by the CSIR at its International Conference Centre in Pretoria, South Africa. In the winter months the northern balcony (upper photograph) sees the Sun from sunrise from sunset. 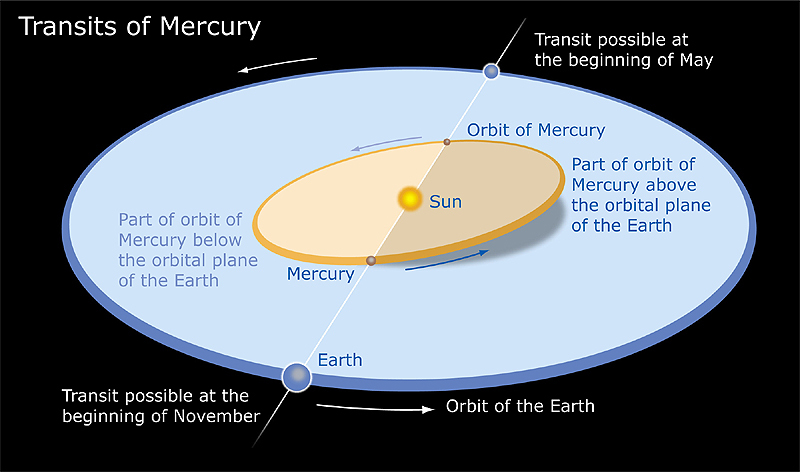 Every two months Mercury’s orbit carries it between the Earth and the Sun, but seldom at the right elevation to be directly in line with the Sun. It passes mostly north or south of the Sun, that is, above or below the ecliptic due to its orbit being tilted at 7 degrees to Earth’s orbital plane – called the plane of the ecliptic. The two points in its orbit where Mercury crosses through the ecliptic – called nodes - are the only times when the Sun, Mercury and Earth can be in a direct line. Mercury must be on a node at the time it passes between the Sun and Earth for it to appear directly in front of the Sun. On these occasions Mercury is said to ‘transit’ the Sun from our Earthly point of view. The geometry and orbital timing conspire to make this special alignment rare. Imagine the Sun being the size of a pea in the upturned palm of your outstretched right arm and the Earth lying in the palm of your outstretched left arm. When scaled down to only this 1 meter apart, the Sun will be the size of a pea and the Earth will fit into the thickness of a sheet of paper. Mercury will a third of Earth’s diameter and be lie on your right bicep. Now – imagine aligning the pea-size Sun and tiny Earth and Mercury on the same straight line! This is what makes a transit of Mercury rare and thus special. 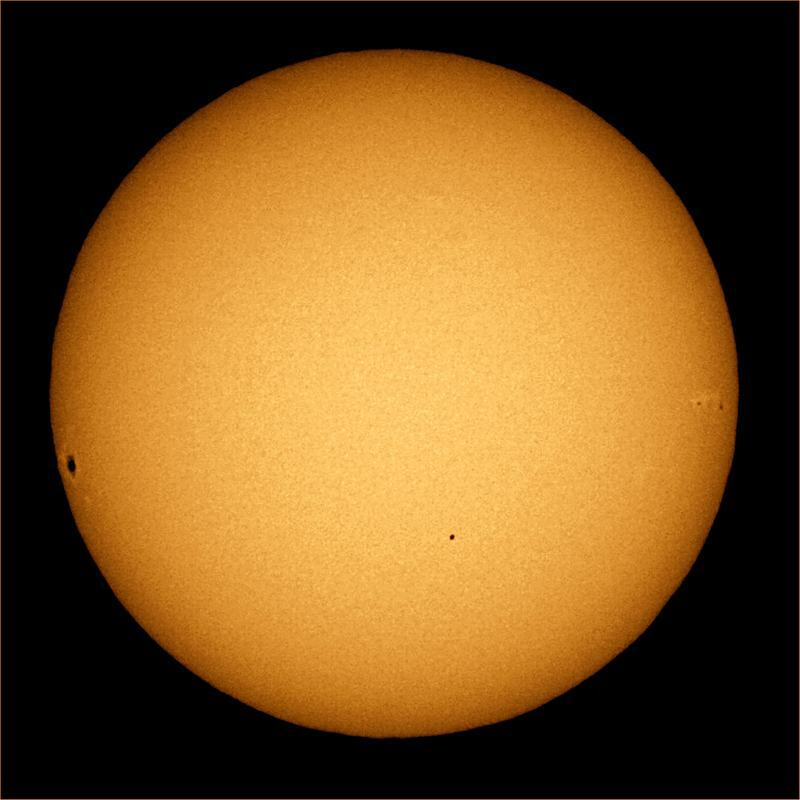 The previous transit was in 2006, the next will be in the late afternoon in 2019 and the one thereafter throughout the day in 2032. A transit is actually a tiny solar eclipse, blocking out 0.005% of the sunlight we receive as compared to the Moon blocking out 100% of the light when it regularly casts its shadow on the Earth’s surface. Unfortunately in the Moon’s case, you have to be at exactly the right place on Earth to be in that shadow, making the chances small that a person would ever see the solar eclipse without making a special effort to go to the a place that the shadow will pass through. 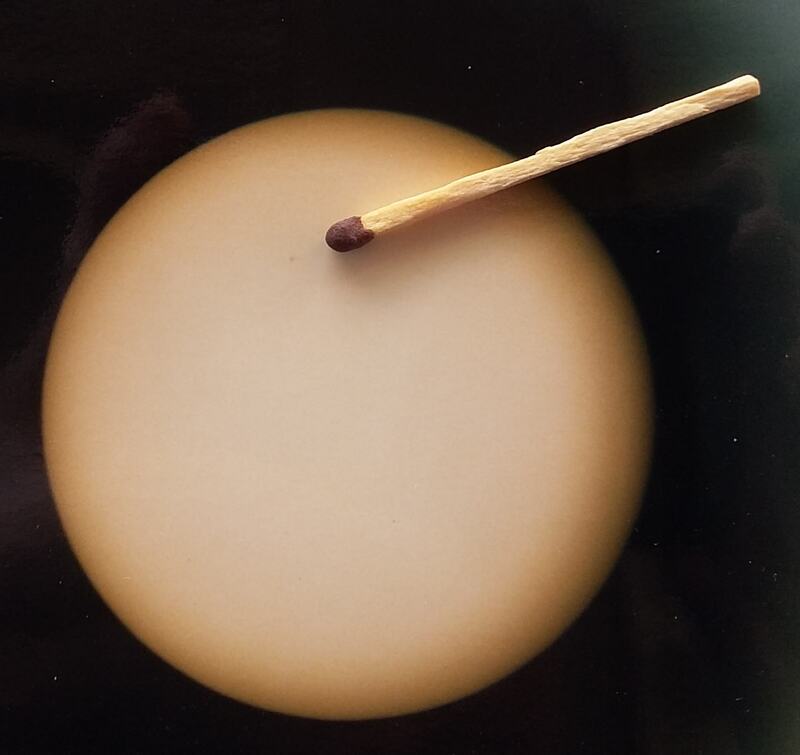 In contrast, when Mercury intercepts the Sun’s light, every human can stand in that shadow on one condition – that they are on the sunward side of Earth when this happens. The shadow is barely more than theoretical though – Mercury appears as a tiny dot taking 7 hours to move across the face of the Sun. The tiny black dot is however big enough to be seen with optical aid such as a small telescope or even with binoculars. But there is a dangerous problem! The bright Sun can hurt your eyes if your stare at it. 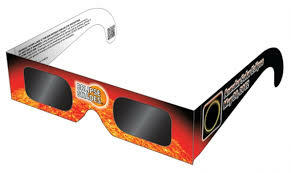 Optical magnification focuses the sunlight and will certainly burn away the retina in the back of your eye. NEVER do this! As with the Sun being eclipsed by the Moon, we can observe the phenomenon only by passing the light through filters to reduce its intensity. The light must be reduced BEFORE it enters any optical instrument, not at the exit before it enters the eye. The focussed heat can damage not only the instrument but may burn through the filter with catastrophic effects. 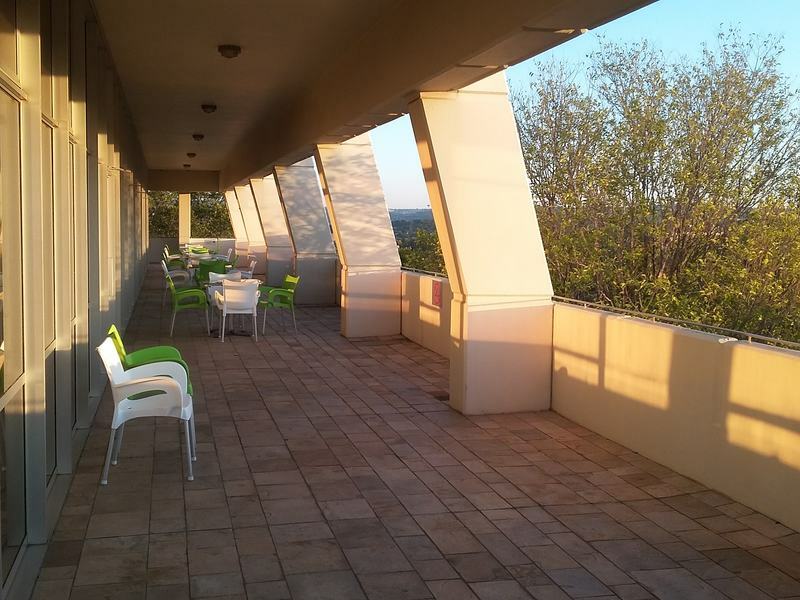 The astronomical society hopes to have many telescopes on the balcony at the conference centre. 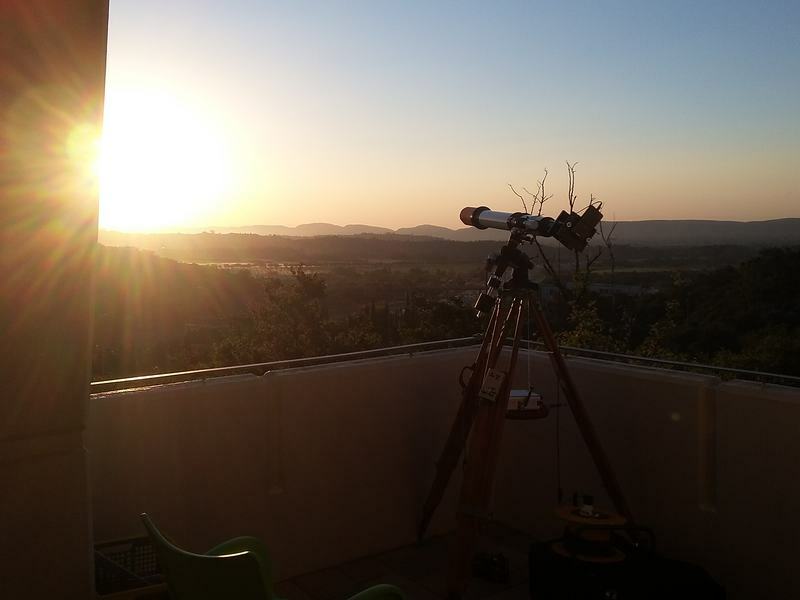 Members of the society will bring their own telescopes not only to take advantage of the magnificent clear view of the north-western sky from the balcony, but also to be able to share the experience with others who have some interest in astronomy – such as CSIR staff members. Come in through the boom at the recreation site and follow the signs at the conference centre to viewing balcony. 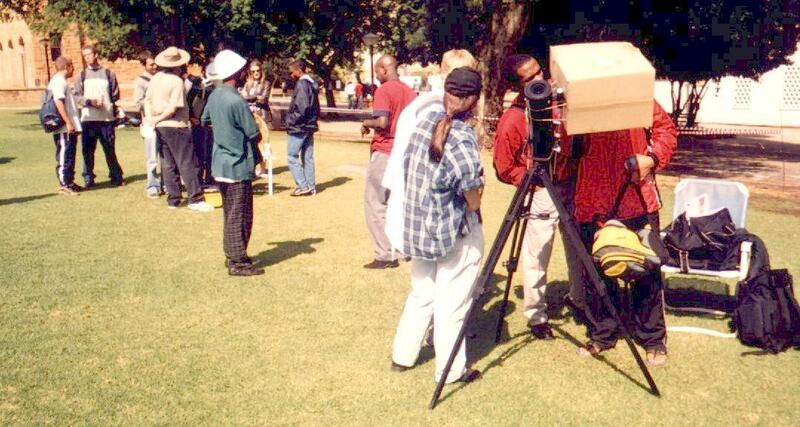 An image taken from Pretoria of the 2003 Mercury transit. A big sunspot on the left with Mercury lower middle. I viewed a transit in 1986 with the late Dr Jannie Smit. 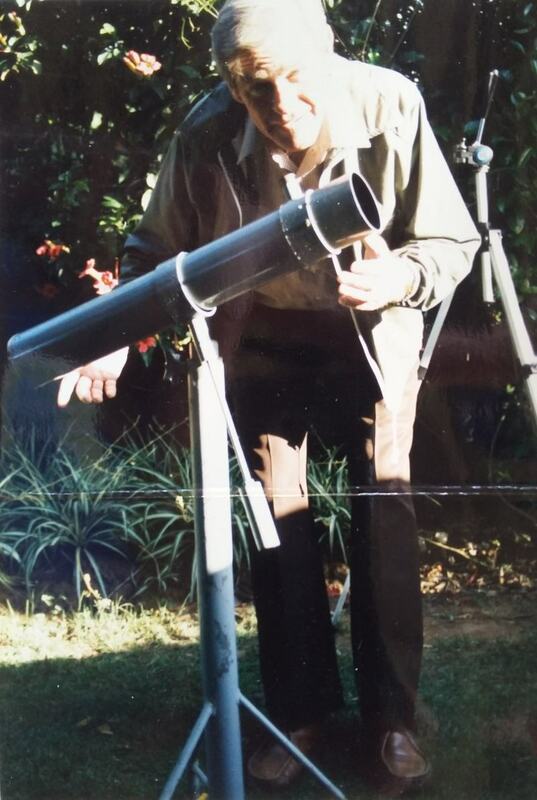 He had an 80mm reflector telescope with an un-silvered mirror which allowed 90% of the light to pass out through the back of the telescope. The 10% that was reflected was passed through a glass filter in the eyepiece which itself reduced the light intensity by 10%. The resulting 1% was plenty to be able to visually eyeball Mercury. I placed my camera (celluloid film in those days) on a tripod positioned to look into the eyepiece and managed to take this photograph. Mercury is a tiny spot just ahead of the match head. 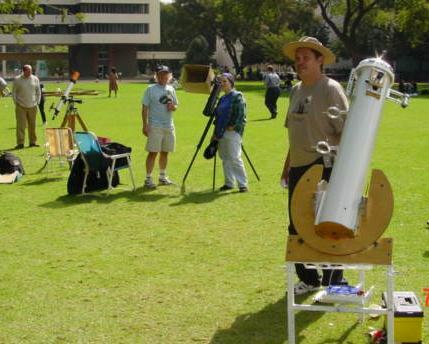 The Pretoria astronomy club arranged to view the transit from the lawn in front of the Ou Lettere Gebou at the University of Pretoria (Tukkies). 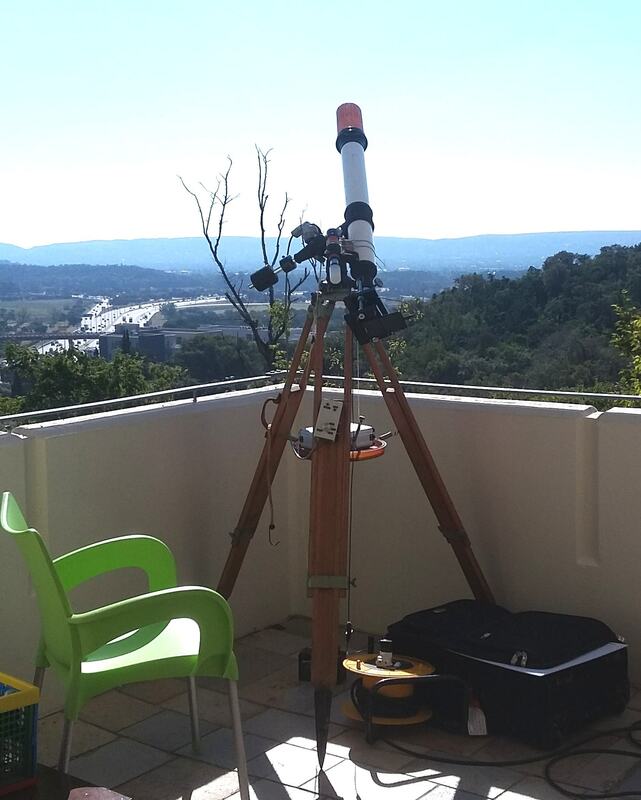 An enterprising club member Mauritz Geyser fitted a webcam to his telescope. 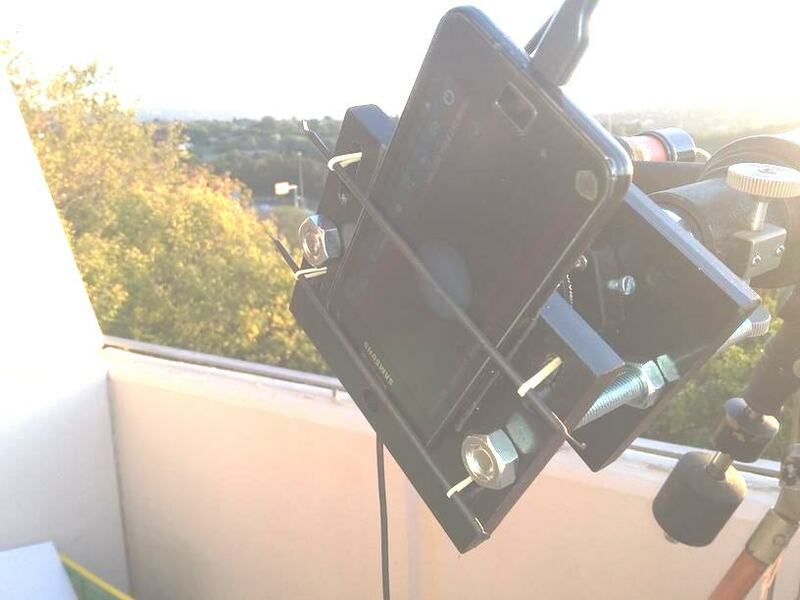 From its position on the roof of the physics building he was able to transmit the images via and Ethernet cable into the Tukkies intranet where the staff where able to watch the progression of the transit. 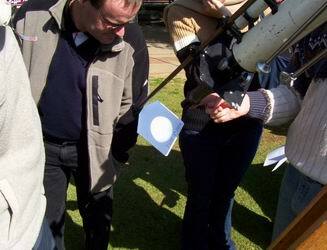 Students and staff popped by all day on the lawn to directly see the transit through the telescopes. 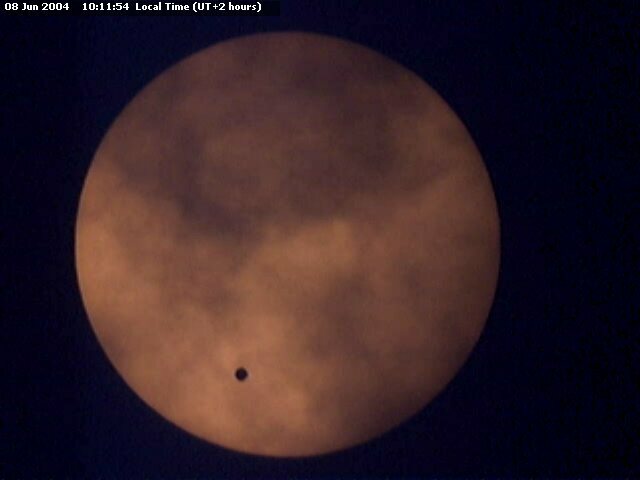 This image was taken by Mauritz early in the morning of that 2003 transit. Some or all of the following viewing methods will be employed on the balcony. BUT FIRSTLY - Whatever viewing method is used, it is imperative that the light intensity be filtered down to less than 1% BEFORE entering any optical instrument. Telescopes can have a filter covering the entire front end of the tube or even have a reduced aperture and placing a filter over that. Very Very Very Dark Glasses will be available at the balcony. For the unaided but filtered eye, the dot will be too small to see sunspots but the Sun nevertheless makes an impressive image especially if there are sunspots such as this one that I photographed on 11 April. Eyepiece Projection is a method of projecting the image exiting from the eyepiece of a telescope or binoculars onto a white surface. The advantage with this method is that several people can look at it at the same time and perhaps photograph it too. Mercury is small and far away and so it makes a tiny black dot against the background glare of the Sun. It would take 150 black dots to span the Sun’s disk. Photographs can be taken by fitting a camera to a telescope in various configurations, but what has become popular at public viewing events is for visitors to take photographs of the big planets Jupiter and Saturn with their cellphone cameras by aiming into the telescope eyepiece. It is amazing how good these smartphones are at capturing the image although there is some skill, patience and luck at lining up the camera lens to look squarely into the eyepiece lens. A bracket was made which fastens onto the telescope tube. A cell camera is carefully positioned on the bracket. An old Samsung Galaxy S2 cell phone is being used as the camera. An app called MobileWebCam (Android app) takes images every 60 seconds and transmits an image via the wifi network to a big screen in one of the conference rooms, then further on to a CSIR web page. Each 3264 x 2448 pixel image is stored on the camera and also FTPed for safe storage. The telescope is a 50 year old Tasco refractor 900 focal length by 76 mm aperture with a 40mm eyepiece into which the cell camera looks. The cell camera is set to maximum zoom. 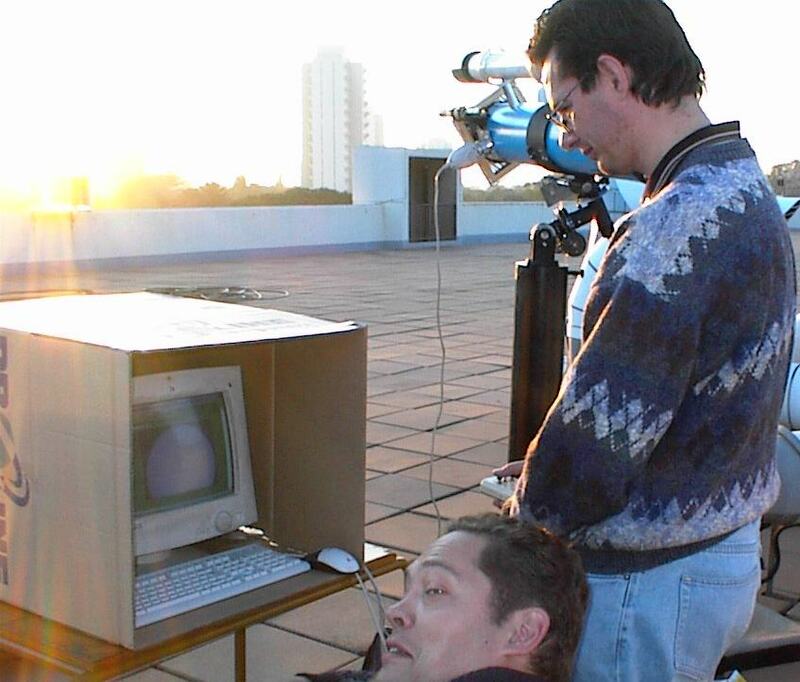 We had a cloudy morning for the Venus transit in 2004! This event happens 2 in 8years and then not again until another pair of transits 110 years later. Fortunately the sky did clear during the morning.